Despite its compact size, the Algiz RT7 doesn’t skimp on battery life or connectivity options. It carries a powerful and rechargeable Li-Ion battery for long days in the field. LTE compatibility keeps your team connected without lag time, anywhere you go. And the Algiz RT7 houses NFC functionality, an integrated stand-alone u-blox GPS receiver, accelerometer, gyroscope and eCompass, plus an optional dedicated barcode scanner and eTicket RFID reader. The Algiz RT7 includes a built-in 8-megapixel camera and offers several port options including USB, Ethernet, micro-USB and headphone and microphone jacks — so you can attach any additional equipment you need to do your job. And for optimum versatility, the Algiz RT7 provides user-accessible dual SIM card slots. 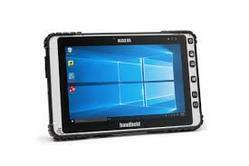 The powerful Algiz® 10X rugged tablet offers sophisticated technology and can withstand weather elements and harsh handling — a perfect match for today’s mobile workforce. It operates on a powerful Intel® quad-core processor, with a 128 GB SSD, expandable via microSD™, and 4 GB of DDR3 RAM, offering top-of-the-line computing capability and massive storage capacity. The Algiz 10X comes standard with Windows 10 Enterprise LTSB (64-bit). 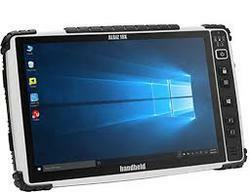 The Algiz 10X features a crisp and bright 10.1-inch full HD projected capacitive touchscreen, and comes with an optional active capacitive stylus plus rain and glove modes — perfect for field professionals who need a large display to handle detailed maps or other visuals in any weather condition. The screen’s ambient light sensor adjusts backlighting automatically — so collecting data in bright sunlight is just as easy as reviewing it indoors. The Algiz 10X is also available with RESISTIVE TOUCHSCREEN. The Algiz 8X’s compact size makes it the perfect companion for today’s mobile field workers. It’s only 24 mm thick and weighs less than a kilo, including the powerhouse battery. Along with sleek design, the Algiz 8X offers snappy performance and can withstand harsh handling and tough outdoor and industrial environments, from mining to maintenance. The Algiz 8X is IP65-rated and meets stringent MIL-STD-810G military standards for protection against dust, water, vibrations, drops, extreme temperatures and varying altitudes. 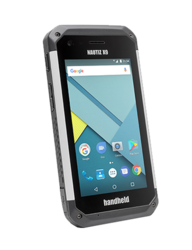 It transitions seamlessly from the office to the field and back again, making field computing easy and keeping your information safe. With its bright, 8-inch capacitive touchscreen made of chemically strengthened glass, the Algiz 8X comes ready to display your work, indoors and out. It supports rain mode, glove mode and active pen mode for flexibility in challenging and changing conditions. And moving between work environments is no problem, thanks to an ambient light sensor that adjusts backlighting automatically. The Algiz 8X facilitates easy data capture with a range of convenient features. It has front- and rear-facing cameras, plus a hot-swappable battery pack. An integrated u-blox® NEOM8N GPS/GLONASS receiver provides robust GIS capabilities. The rugged Algiz 8X pairs with other industry-specific technology via several port types, and multiple communications capabilities keep your team connected. Customizable options for Ethernet, serial (UART) or barcode reading allow the Algiz 8X to conform to your specific requirements. For developers, the Algiz 8X goes even farther — docking pins and a specialized “backpack” mean that your team can customize additional capabilities and proprietary creations. Vehicle cradles and mounts, multi-slot chargers and multiple carrying cases allow you to outfit your team for maximum efficiency. 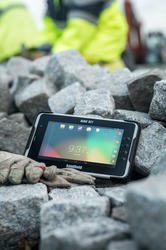 With a full range of features and built rugged from the inside out, the powerful, compact Algiz 8X offers an ideal compact tablet solution at an excellent value for today’s field professionals.